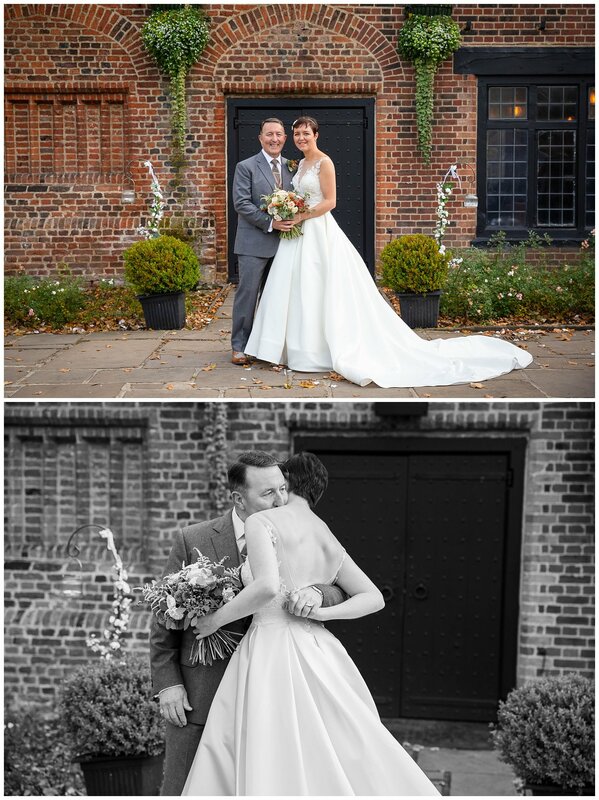 Chris and Cathy chose to have their Wedding at Tudor Barn in Eltham. Together, they run a successful restoration company restoring old historic listed buildings across the country. So, of course their wedding day needed a venue with lots of history. They liked the idea of a barn wedding with lovely gardens. 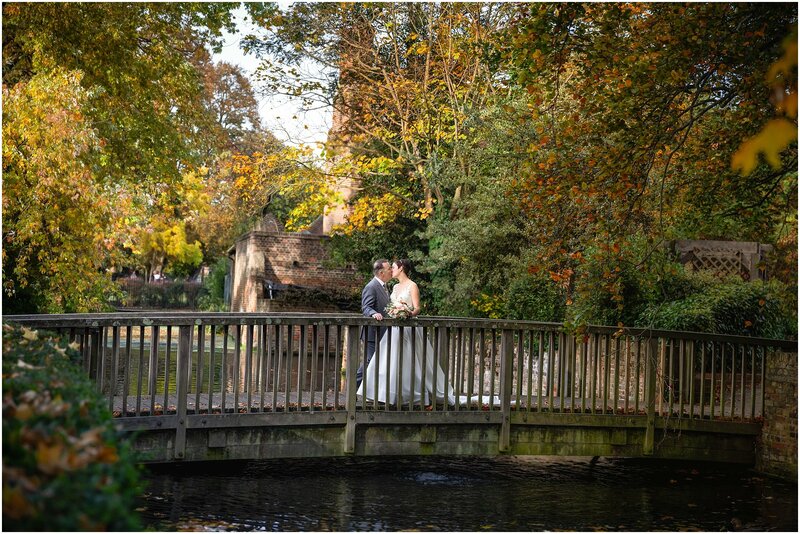 Having your wedding at Tudor barn means you get to use the beautiful grounds of Well Hall Pleasance next to the barn. 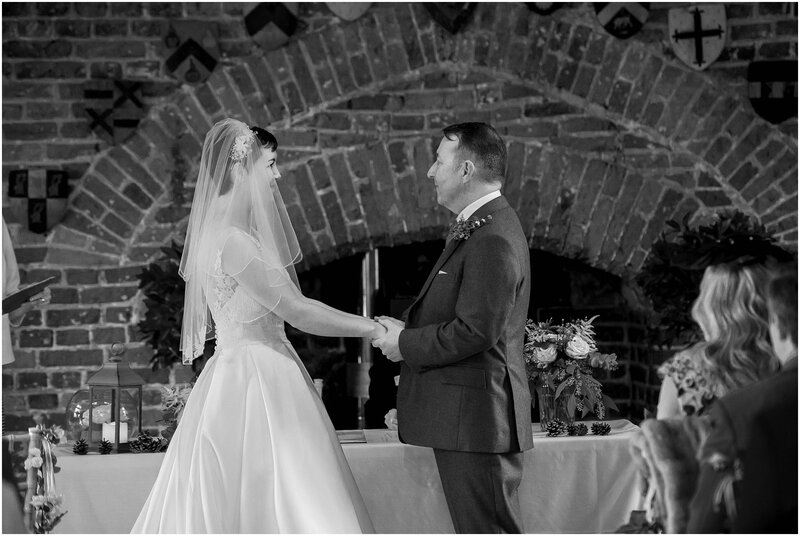 So a wedding at The Tudor barn was perfect. 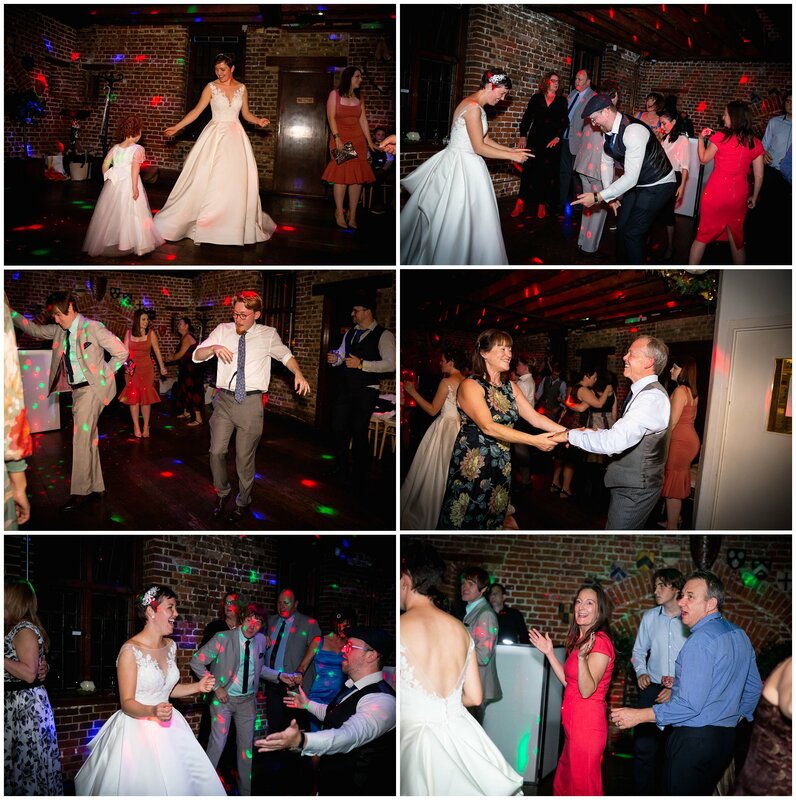 This venue is the only existing Tudor Barn in London, a hidden treasure in the borough of Greenwich. 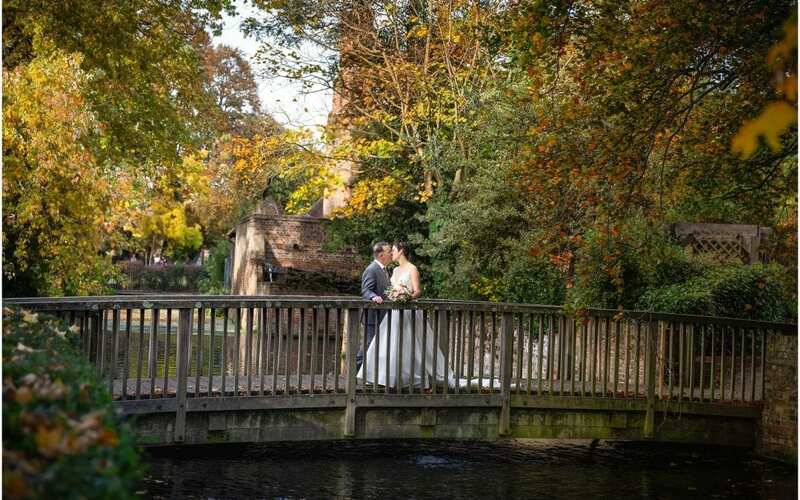 It is surrounded by acres of parkland that are perfect for wedding photos and even still has the medieval moat. 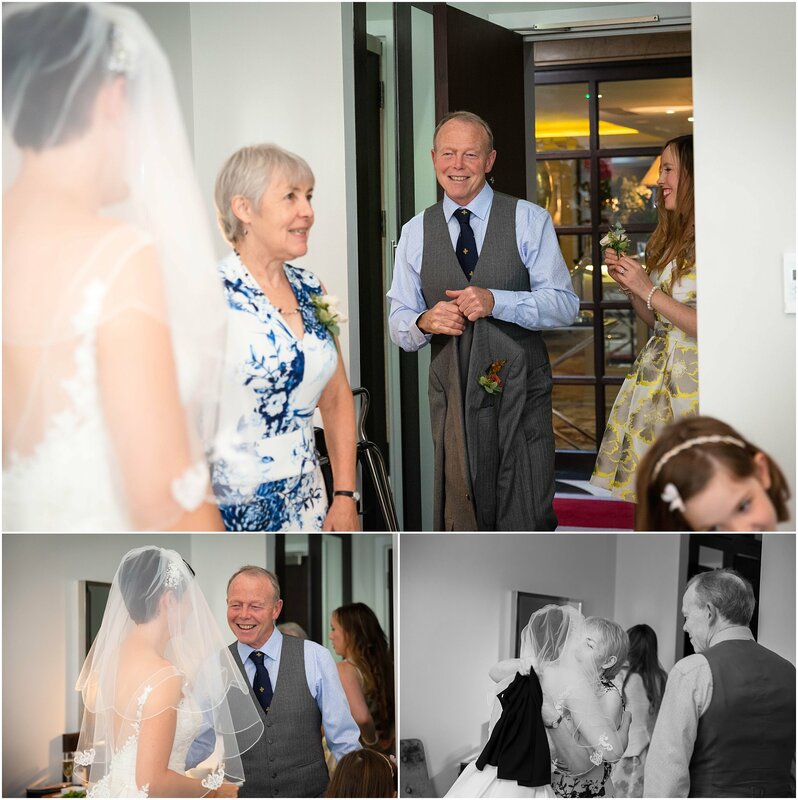 The morning started at the Hilton Double Tree, Greenwich with Chris enjoying a few drinks with his friends and family, whilst Cathy spent a chilled morning with her mum, sister and relatives. The day was so relaxed. Considering it was October the sun was shining and the colours on the trees were beautiful. 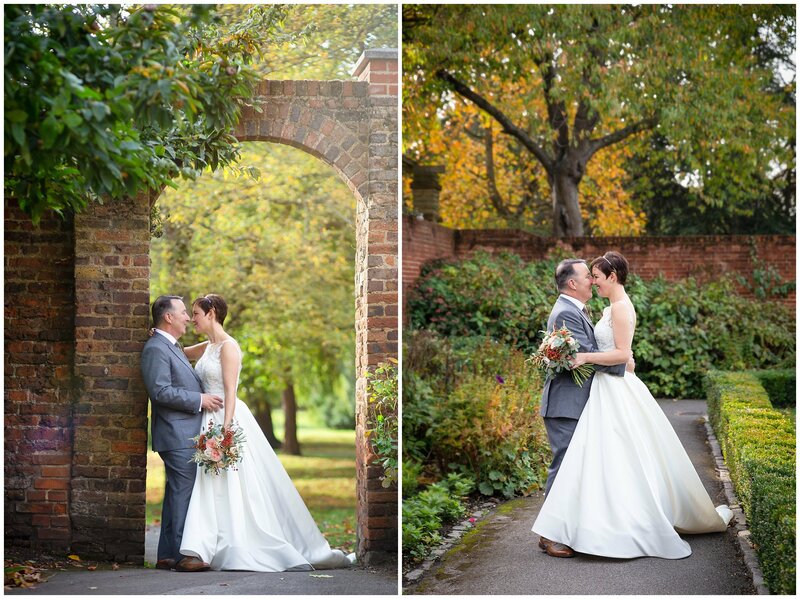 An Autumn wedding pretty much guarantees stunning wedding photographs. 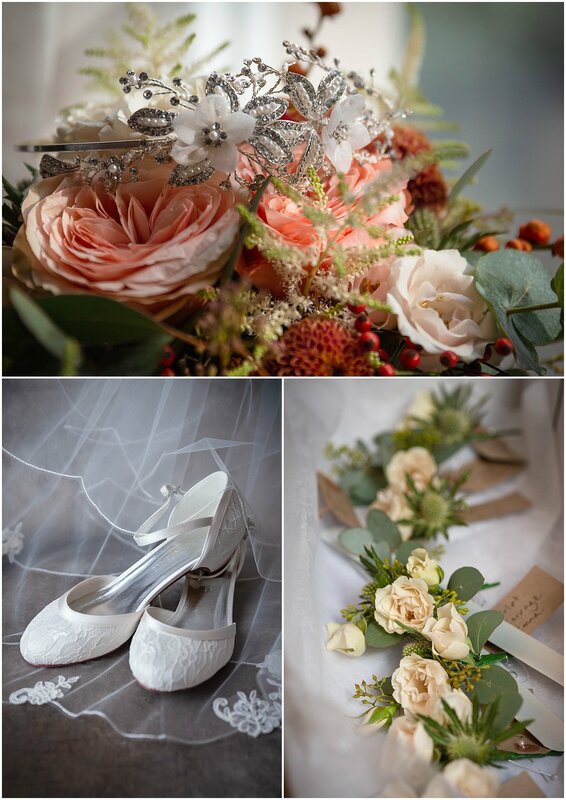 Cathy’s flowers were a stunning mix of Autumn colours and included roses, fern, berries and gypsophellia. The cake was just amazing. It was actually a replica of the building that Chris and Cathy were working on and even included a replica mini bride and groom. It was huge and tasted amazing….I can vouch for that! 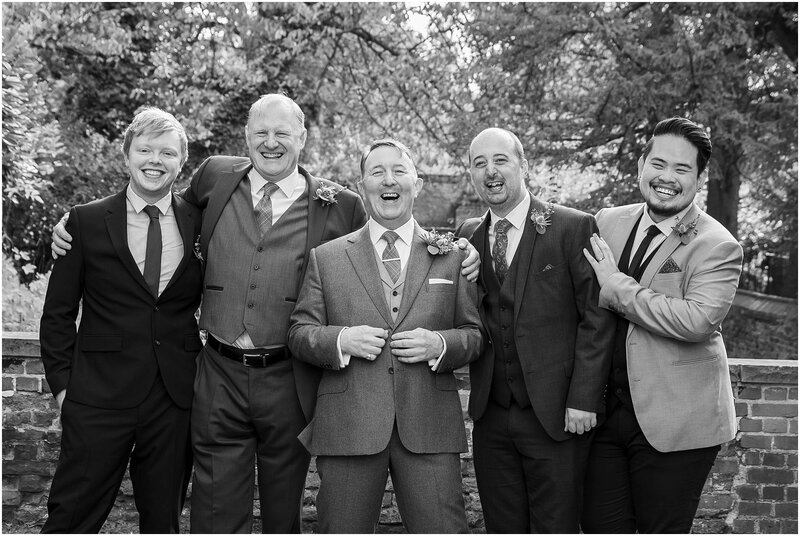 I thoroughly enjoyed this wedding so laid back, full of emotion with one of the best wedding playlists ever! 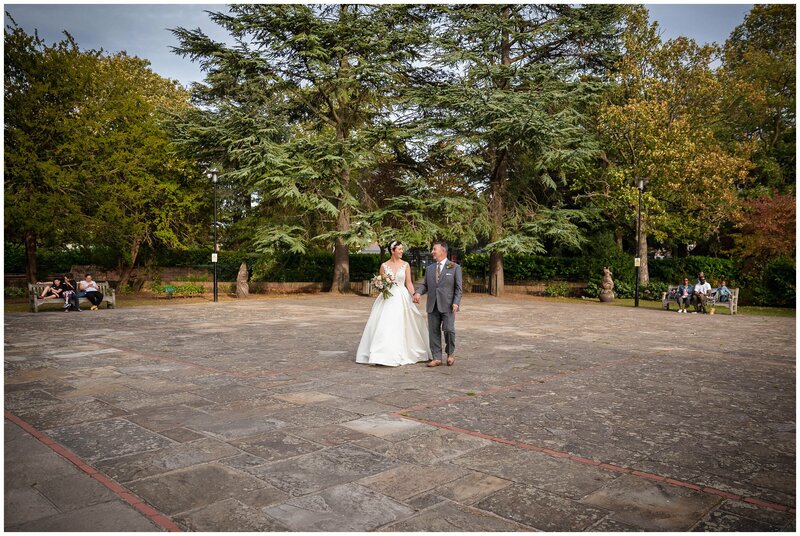 A Mediterranean inspired wedding day at The Orangery, Maidstone, Kent. 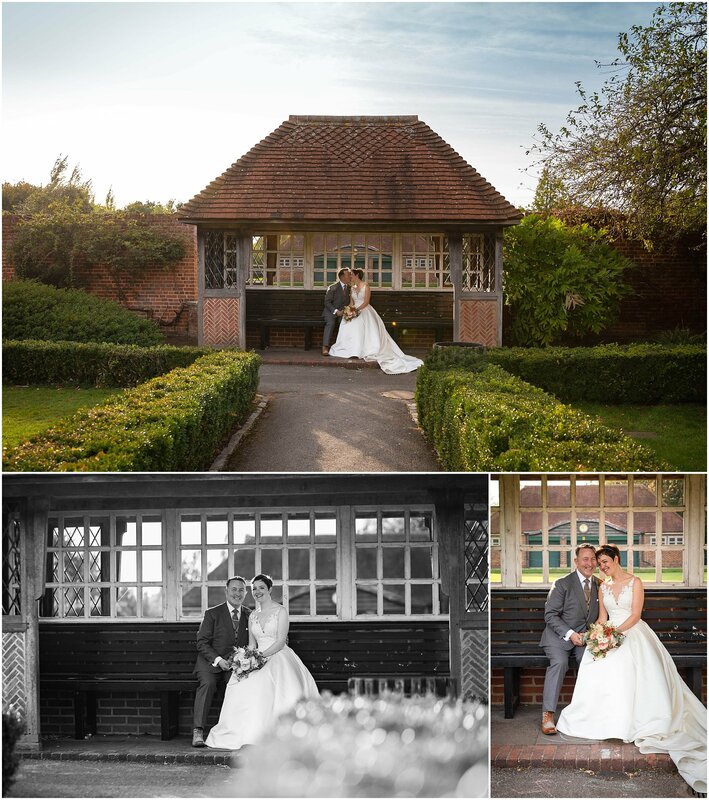 Bekim and Rebecca were married in July at the Orangery in Maidstone, Kent. I arrived at Rebecca’s mums house to all the girls drinking bucks fizz and getting their hair and make up done. 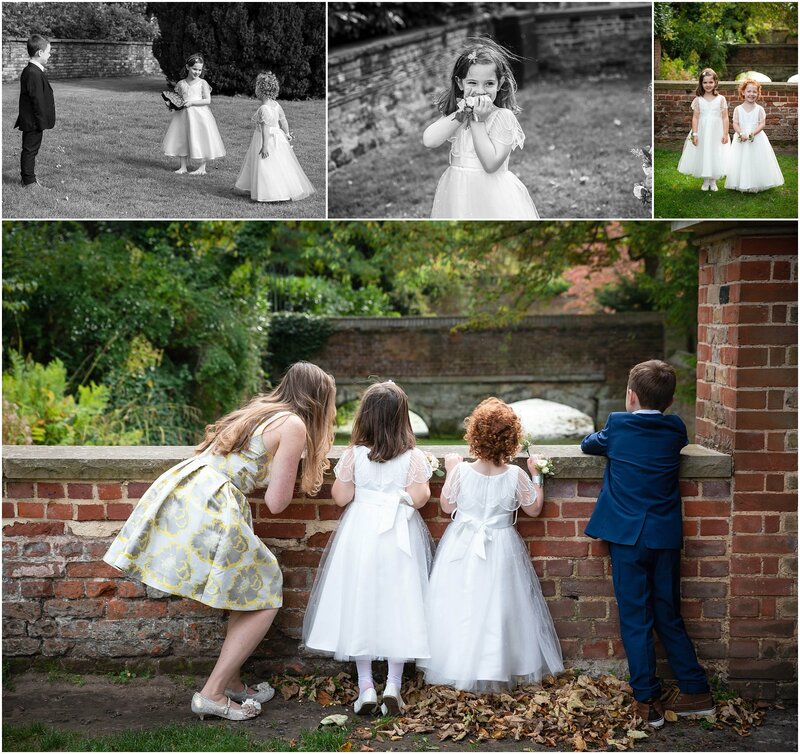 As it was such a hot day the girls decided that they would travel to the venue a little earlier and change into their dresses The Orangery’s Wisteria Suite. 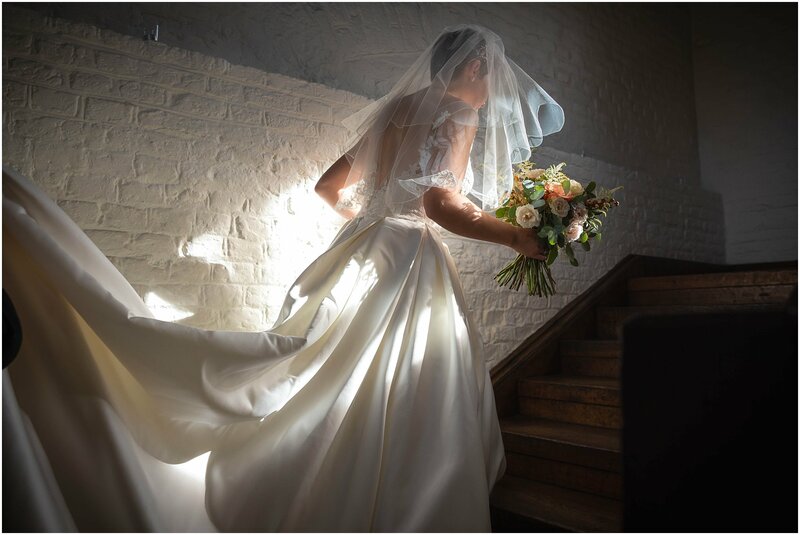 The Wisteria Suite is a lovely big room with lots of lovely natural light to chill out and enjoy the wedding prep. Plus is far enough away from the main area so to avoid bumping into the groom or any of the guests. Bekim is from Albania and the couple wanted to reflect this in their big day. The beautiful Mediterranean olive sprigs in the bridesmaids bouquets, matched perfectly with the brides striking why hydrangea bouquet. 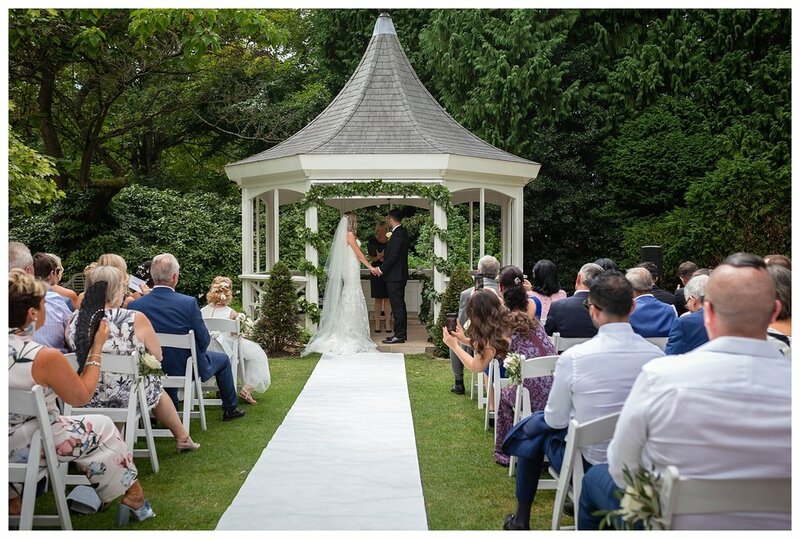 Rebecca and Bekim decided to have their wedding ceremony in the The Orangery’s Gazebo. 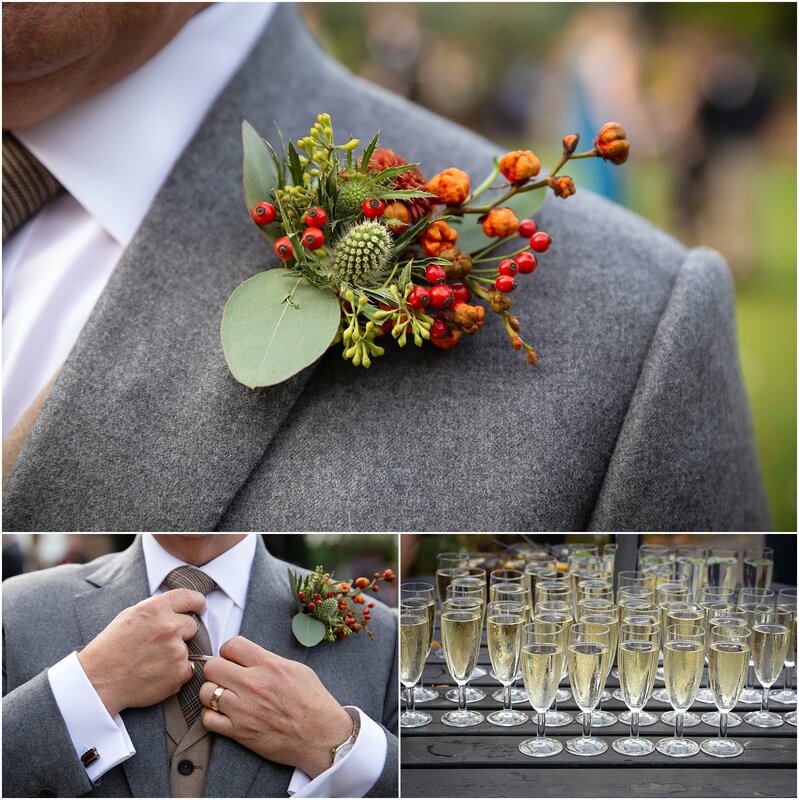 It was so stylishly dressed with handmade garlands of Eucalyptus and Olive. The Mediterranean feel was carried into the décor in the dining room of The Orangery. The favors were a cute little bottle of the traditional Albanian drink Raki. 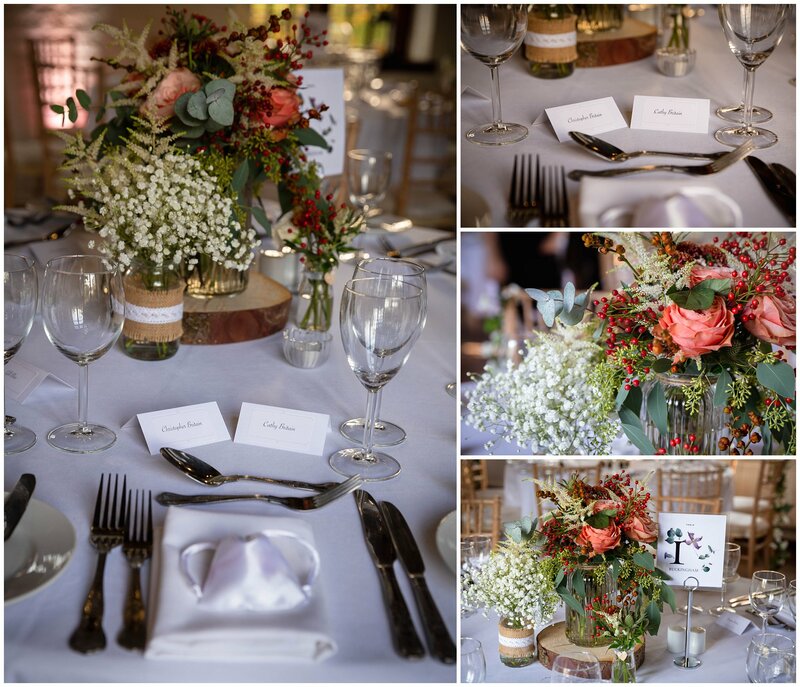 The place settings were set with a sprig of Olive, candles and the gold cutlery matched the theme perfectly. The meal was Mediterranean inspired with Hummus, Tzatziki, olives, minted lamp kebabs and Albanian Kofte. As the day was so hot, we decided to take the couples portraits after dinner and speeches. The sun was so much softer, plus it was a bit cooler. So at 8pm we walked around the grounds to capture so gorgeous bride and groom photos. The day was finished of with some fun Albanian Greek dancing. Everyone was up on the dancefloor, including myself and Stephanie, my second photographer. I really did enjoy the day and had a lot of fun. 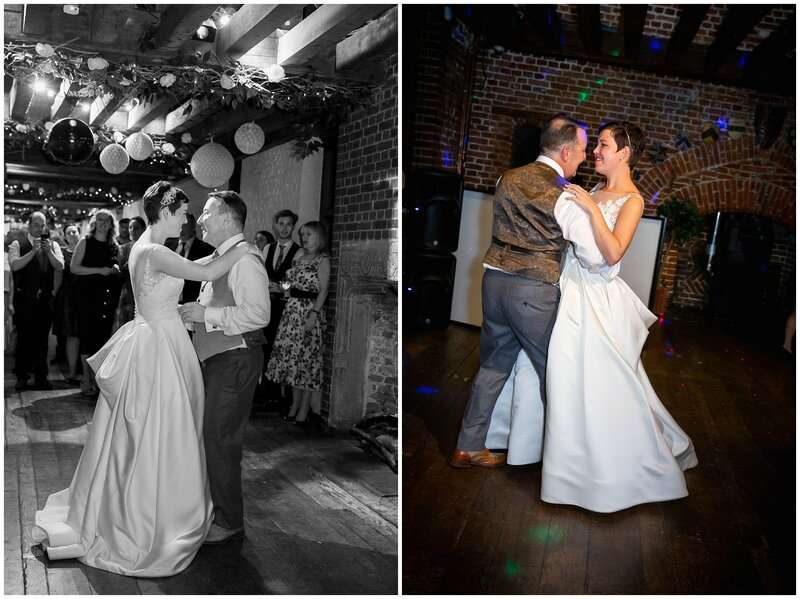 I just love Marleybrook House wedding venue in Canterbury, Kent. A photographer’s dream! A really quirky and romantic little place that is fun to explore. Its set it beautiful grounds with a willow tree and a lake, a glade and all set a round pretty little thatched cottage. 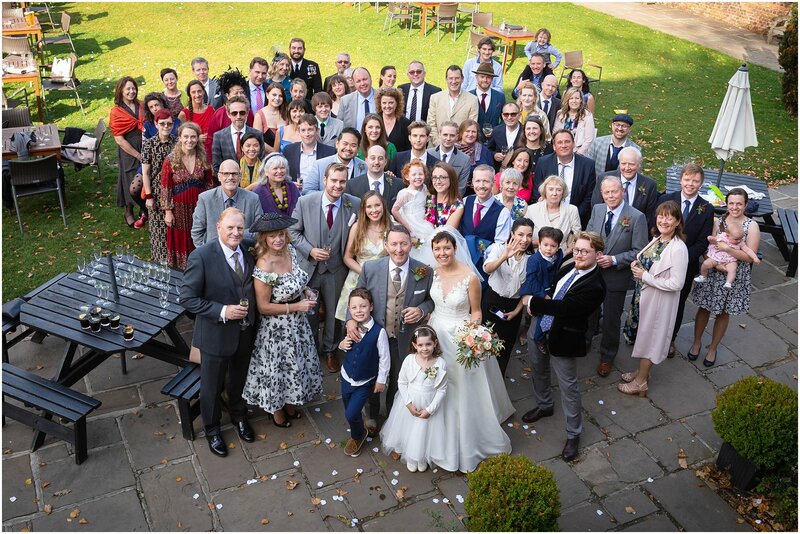 It has a marquee or Oak barn for the wedding reception, a beautiful gazebo and even has its own Vintage fair with swing boats and hook a duck!…. Del and Katys day was a sunny hot one. 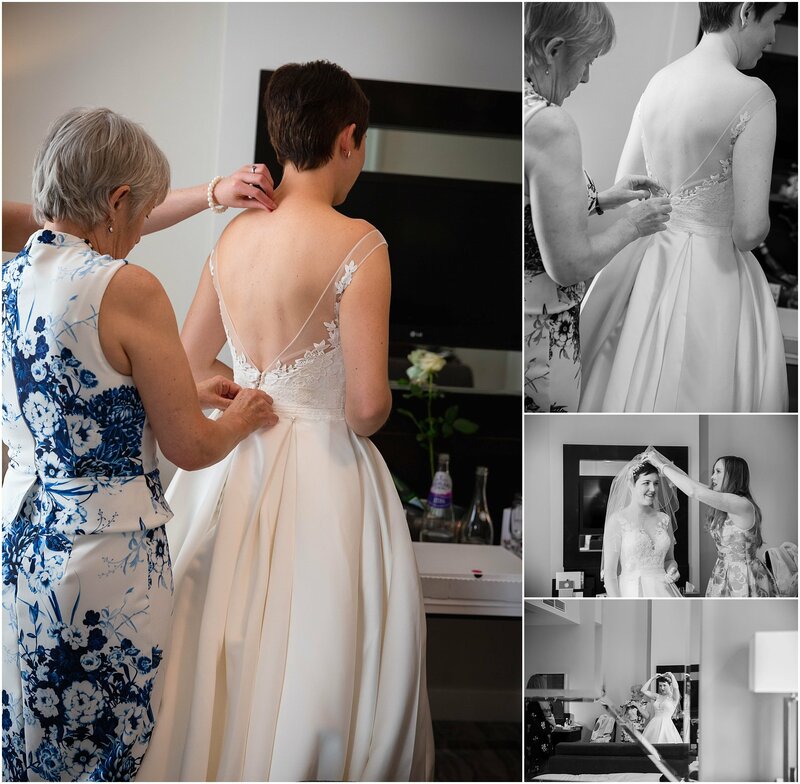 I arrived in the morning to see Katy and her bridesmaids all chilling out in the beautiful bridal suite and getting their hair and make up done. The bridal suite is beautiful. Big light and airy with plenty of room for the bridesmaids to have a sleep over the night before. Along with a whole separate room for all the hair and make up. It even has its own hot tub that the girls took full advantage of the night before. While Del had stayed at a nearby hotel and arrived a little later. 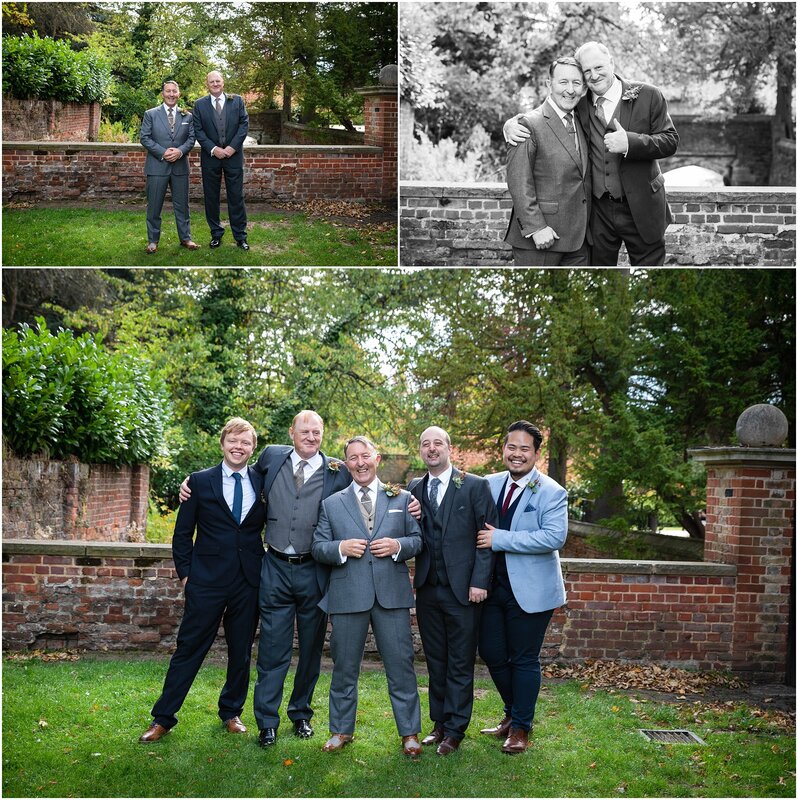 He relaxed with a few beers in the cosy bar with his best man and ushers. 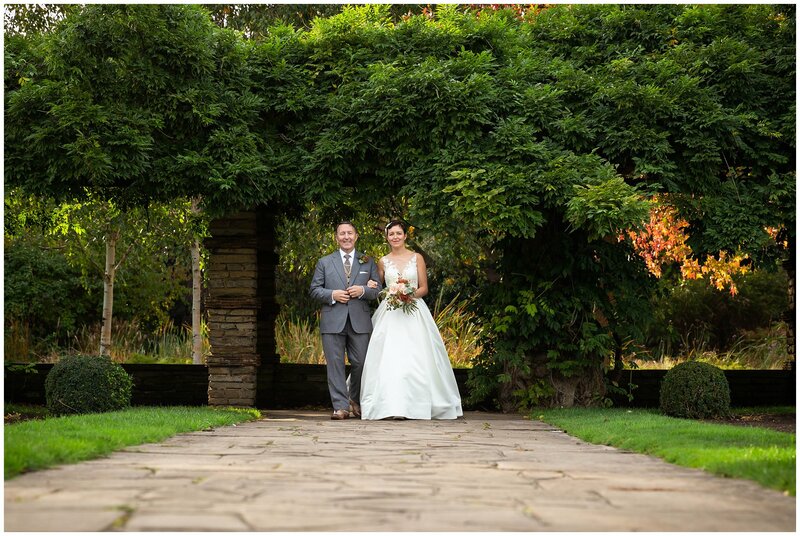 The ceremony was in the Walled Garden with its topiary and lavender lined aisle. I did notice how green and well kept everything was despite the scorching heatwave that we had. The grounds are very well looked after. First up the aisle was the flower girls, who looked so cute with their little white dresses and floral head bands made by the very talented Tracey of Mrs Bouquet Flowers and the cute little page boys in their shorts and braces. The bridesmaids in their pretty pale pink dresses from Coastlooked lovely and did a great job in helping Katy manage her stunning elegant full length veil. Ceremony complete, confetti thrown.. it was time for the drinks reception in the Vintage fair. Champagne, Prosecco and raspberry shots, plenty of beers, mini burgers with chips and toffee apple were keeping everyone happy, along with rides on the swing boats and a game of hook a duck or tin can alley. During dinner the talented Fil Straughan enterained the guests. Walking around the tables singing to individuals and getting people to join in. 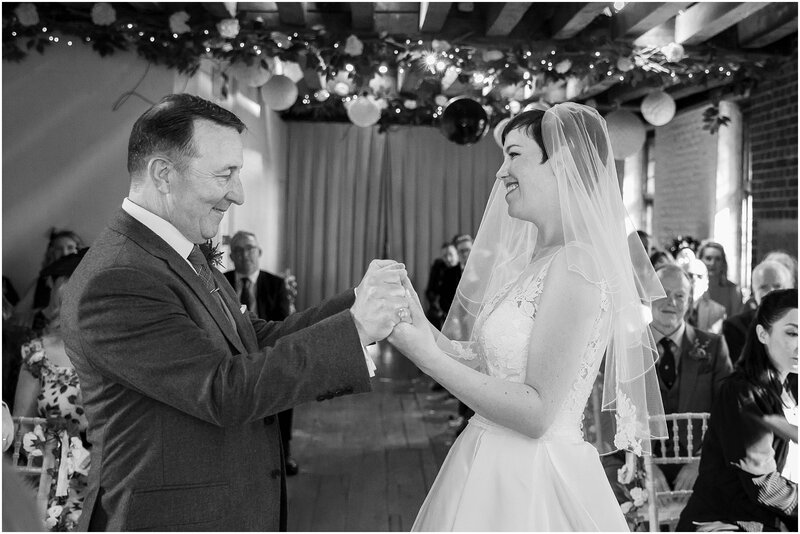 Singing a mix of both old and new songs, he has a clever way of being able to change the lyrics to a song to suit the guest – had everyone laughing and up dancing – this was before dinner was even served! Where did you buy your dress? Why did you choose it? What made you choose your venue? It was a perfect mix between myself and my Husband. We both LOVED it from the minute we saw it. We just knew it was the one. Who was you florist? What made you chose your flowers? 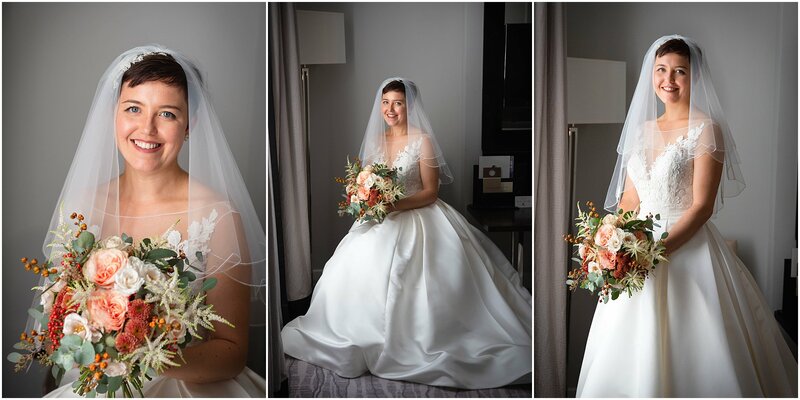 Mrs Bouquet – I wanted flowers that really suited my venue and I felt like Mrs Bouquet got this absolutely perfect. Any bit of advice to any upcoming brides? To Just enjoy every second of the build-up, don’t stress. It all comes and goes so fast so you just need to sit back and take it all in. Always smile!!! Danson House, Bexleyheath Kent. A wedding venue with history. 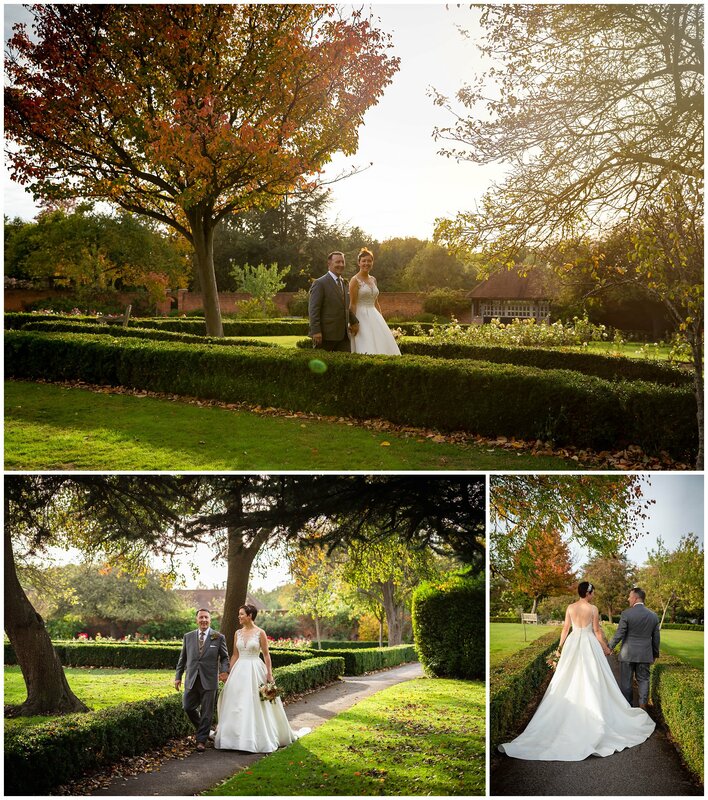 The beautiful Danson House, Bexleyheath has become the official registry office for Bexley Borough. Its a beautiful Georgian Grade I listed building with various different ceremony rooms. All looking out over the beautiful grounds of Danson Park, its lake and the 200 year old Oak tree. The perfect wedding venue. For years it was derelict and, growing up in Bexleyheath, I’d always wondered what was in side the creepy old run down house other than pigeons! Who’d have thought that years later I would be Kent Wedding photographer photographing weddings there. It really is a gorgeous house, steeped in history and being a bit of a geek, I decided to have a look into its past. Fellow history geeks read on………or, if not just have a nose at some of the photos that I have taken of recent weddings here alongside some old photos at the end of the blog, that I found in the archives….see I told you I was a geek. It was built in 1766, designed by the same architect that designed the Bank of England, Sir Robert Taylor. It was built by Sir John Boyd for him and his wife to be, and to celebrate their love, Boyd commissioned an artist to paint romantic wall panels for the Dining Room. Thankfully, when the house started to deteriorate, they were put into storage and have now been restored to their rightful place in the house. 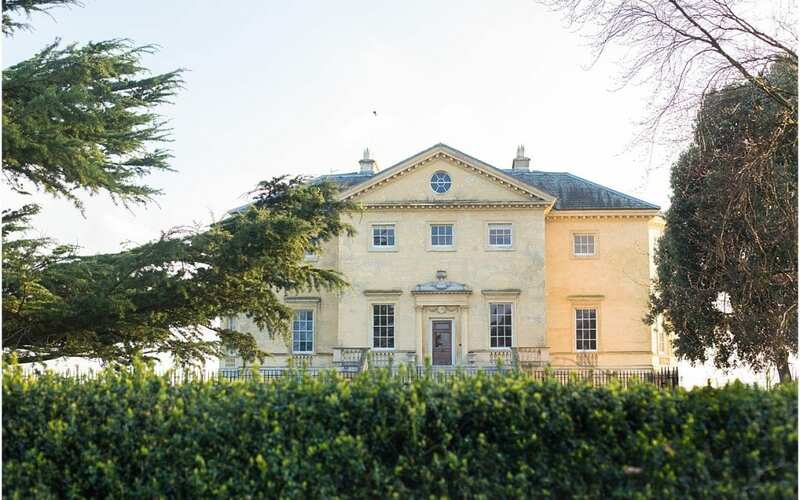 After Sir John Boyds death in 1800 the home was sold onto the Johnston family in 1807 and it was Sarah Johnston’s watercolour paintings of the home in the 1860s, that helped the English Heritage experts massively with the restoration project. In 1862, Alfred Bean bought the house and all its land (582 acres at this point) He intended to transform the whole estate into a residential area/suburb. His will shows that part of the land was sold off for this purpose, but the remaining 224 acres remained in his family until his death and after the death of his widow in the 1920’s. When it was bought by Bexley Council in 1924 for £16,00. Having not been lived in since the 1920s, the house deteriorated and the council couldn’t afford the up keep and so it was left in ruins. In 1995, just months away from being demolished, English Heritage stepped in recognizing that Danson House was the ‘the most significant building at risk in London’. They bought the 999 year lease for £1 and spent the next 10 years and £4.5 million restoring it. Finally July 2005 the Queen officially opened the stunning house to the public. Every room in the house is unique and beautiful. The Library – also known as the music room, over looks the lawns. It also has a fantastic old and original organ that was kept at Hall Place, Bexley until the Council invested in restoring it. The Dining Room – Light and airey, with those romantic paintings and gold finishings. Very romantic. The Salon – With its gorgeous vivd wallpaper. Tiny flecks of silk and flakes of paint discovered on the walls by the English Heritage experts enabled them to recreate the Georgian wall paper that was once there. This is one of my favorite rooms. Even the beautiful spiral staircase in the middle of the house is perfect for photographs. 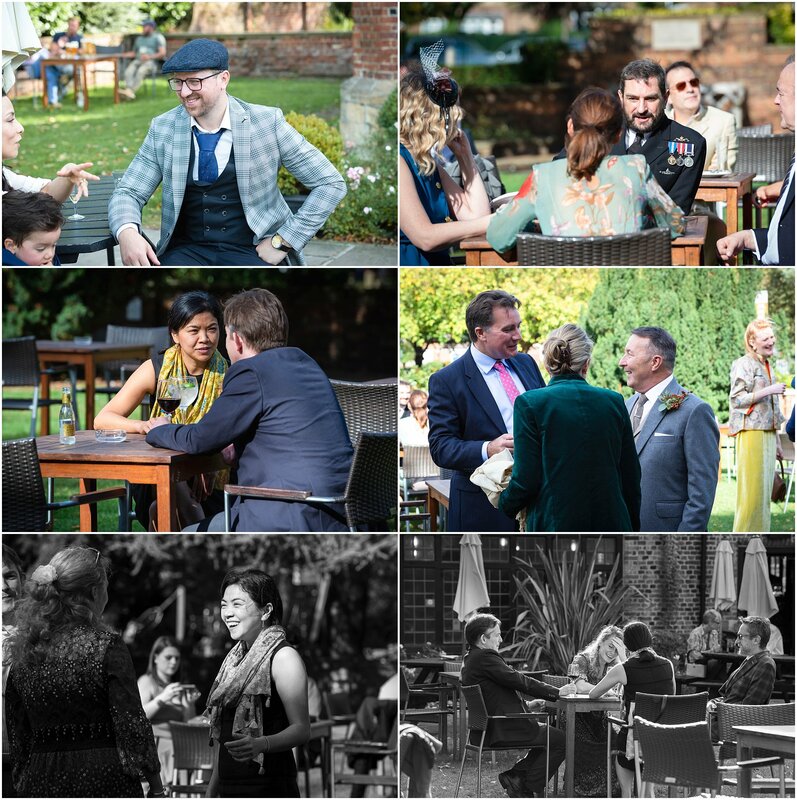 As for photographs on your wedding day, the 200 acres of grounds give you plenty of options. Although its worth noting that you need an extra permit from the Civic offices if you want to have your photographs in the park itself or the ornamental gardens opposite. Although the lawn and grounds to the side of the house and the stairs are equally pretty. 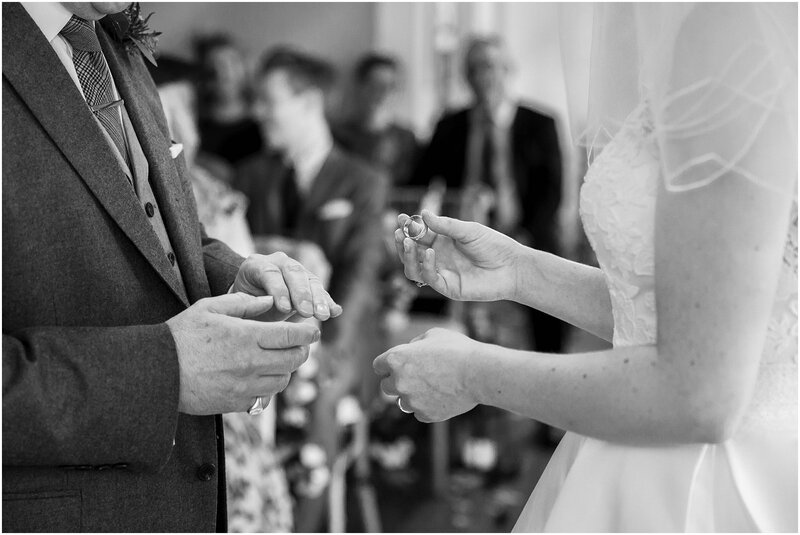 Get in touch to find out about having me photograph your wedding day. I’d love to hear all about your plans. It’s a minefield right? Where do you begin?! There are so many beautiful options ….. 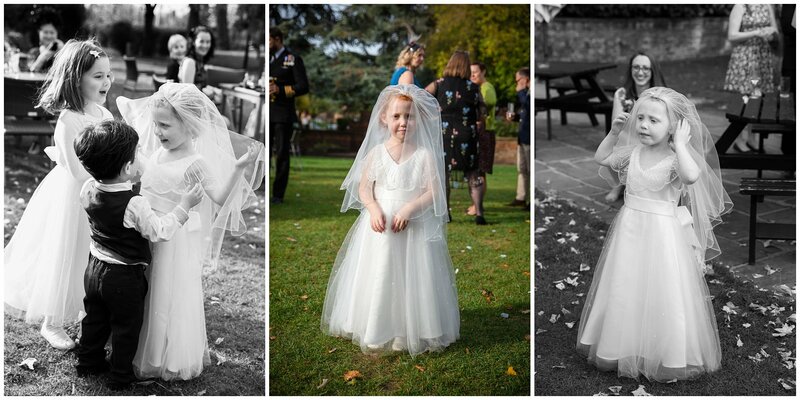 Being a wedding photographer all over Kent, I get to see so many beautiful designs. So I thought I’d share a few tips and ideas that may help along with a few pictures (probably far too many, but I just couldn’t choose) of some of the gorgeous flowers I have photographed in the past. Note the florists contact details underneath each picture and the links to their websites at the bottom of this blog. This is probably the most important point as it determines the type of flowers that you can choose. Decide where you want flowers? Would you like flowers as your center pieces. Do you want flowers at your church? Or your ceremony? Think about button holes, bridesmaids bouquets? What will the flower girls hold? Are you going to give bouquet gifts for mother of the bride/groom? Don’t be afraid to discuss figures with your florist. Be up front, let them know how much you would like to spend and stick to it as much as possible. If you are having floral table centres, how about having these as “thank you” gifts for friends and family. So there are a million types of flowers and you have no idea of their names. 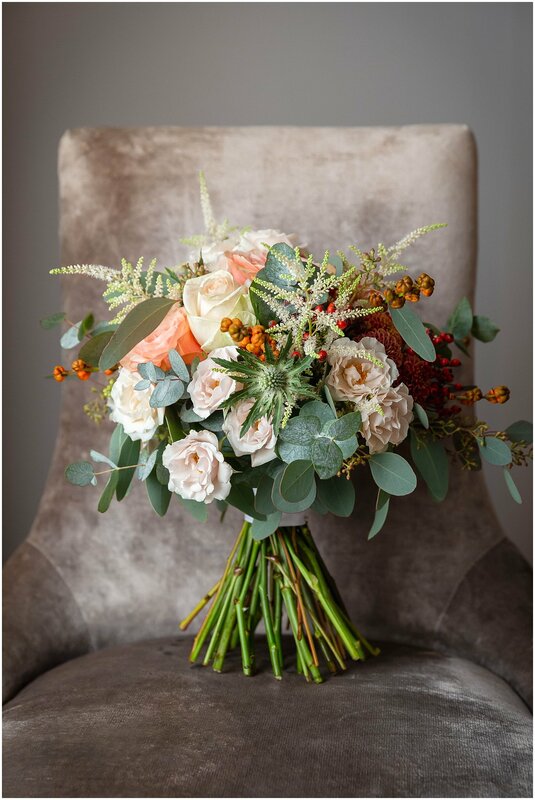 Just familiarize yourself with a few popular wedding flowers; roses, peonies, hydrangeas, lilies, and ranunculuses, gerbera to name a few, and then you can chat with your florist to help you build on that. If you can’t decide on a colour; find your bridesmaid dresses first and co-ordinate to these. You don’t have to be all one colour – contrasting colours can look beautiful. Or hues of all one colour such as peaches with corals. Or lilacs with blues. Or why not just green and white – classic and timeless. Add some sparkle or bling to your bouquet. A diamond on each rose? A sentimental brooch on the stem? 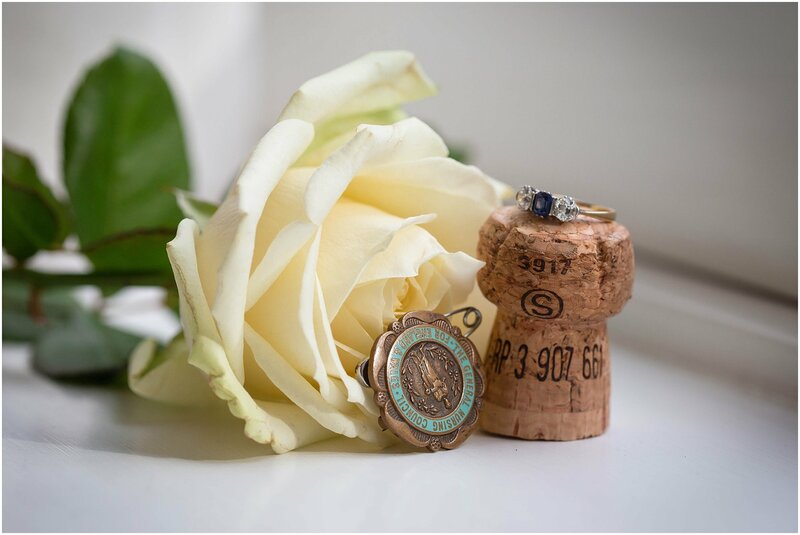 Start with your bouquet as this is your centre piece, and will be in most of your wedding photographs – you can then co-ordinate the rest of your flowers with this. Think about the size of your bouquet. The flowers have to be in proportion to the bride’s height and size and also to the style of the dress. The more intricate the dress – the simpler the bouquet should be. Make a Pinterest board of some ideas that you like and take them with you when you meet with your florist. 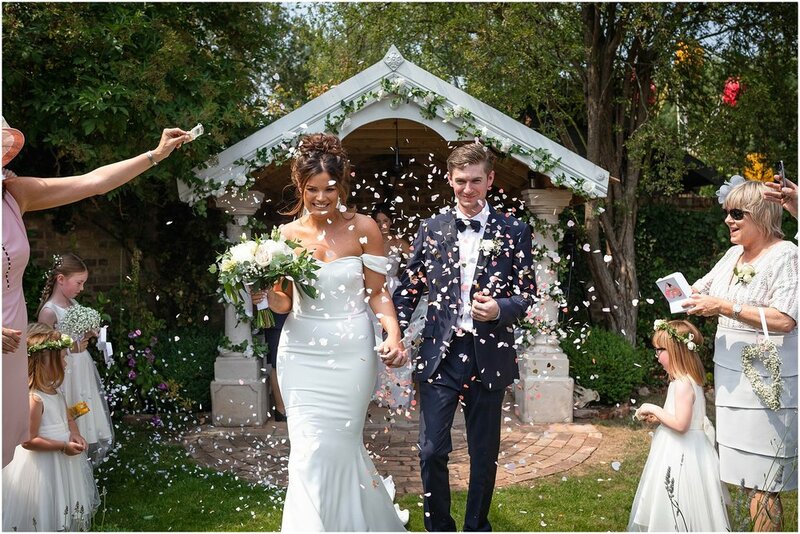 Try to match your flowers with your venue – for example robust Gerberas or Cala Lilies for a modern, city wedding or pretty delicate Roses and gypsophelia for a vintage rustic wedding. Think about your venue’s over all colour. If the ceremony room or reception room have strong bold colours (ie the carpets and curtains); a simple pastel theme may be a little lost. If in doubt ask your florist. They love to put their creativity to the test and know all there is to know about flowers. So you really can’t decide on which flowers to choose. Lots of flowers have superstitions and meanings, so you could use this as a starting point. White – A white rose shows purity, chastity and innocence. Yellow – A yellow rose symbolises friendship and caring. Pink – Pink roses represent emotions, joy and gratitude. Orange – An orange rose symbolises passion and energy. CALA LILLY – If you choose white Calla Lilies for your bridal bouquet then this will symbolise purity and innocence. FREESIA -Much like the Daisy, Freesias represent innocence, they also represent thoughtfulness. PEONY – The peony represents happy life, happy marriage, good health and prosperity, all perfect ways to start a marriage! TULIPS Tulips signify the declaration of love – what flower could be more perfect when you are saying your wedding vows. Have they worked at your venue before? If they haven’t don’t panic – it may be an idea that you have a wander around the venue together. Can you see examples of her work? 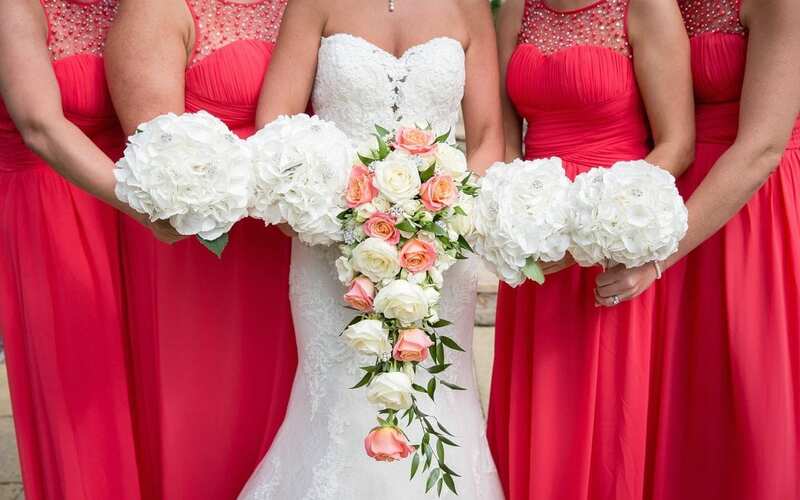 Its not always possible but some florists can provide a mock up of your bouquet. If not ask to see some example of their recent work. Who will be delivering my flowers on the day? Decide where you would like them delivered. Will the button holes need to be at a separate address? When will the final balance be due? How will you return any rented items, such as vases etc. Make sure you have agreed on how many rented items you have and how you go about returning them. Silk flowers are very realistic these days. They are robust and won’t wilt in the heat. Although there is not a great deal of difference in the price to fresh flowers – you will have your bouquet forever. Examples of silk bouquet below. For those who like a bit of bling – how about a bouquet made of jewellery. You could include some pieces of jewellery with sentimental value. See examples below. So you want to arrive in style right?!….. 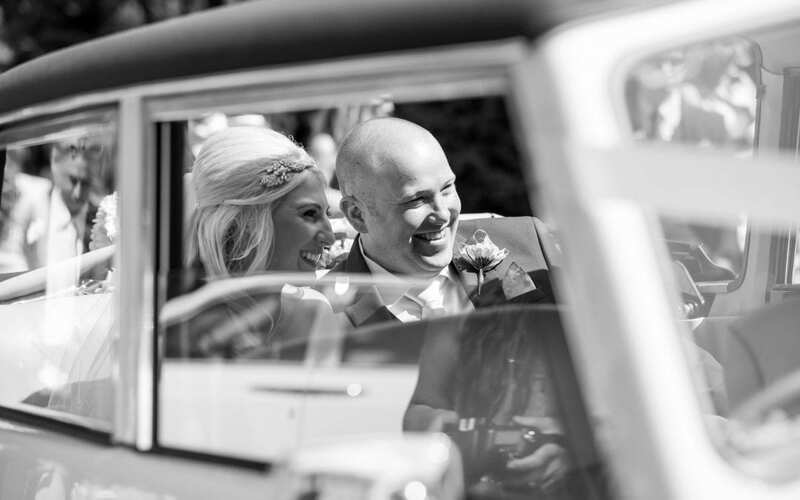 For my big day, I had a beautiful white 1920’s Rolls Royce that took my dad and I to the venue, The Trafalgar Tavern, Greenwich. I loved how passers by stopped and waved and cars tooting as we drove along…. 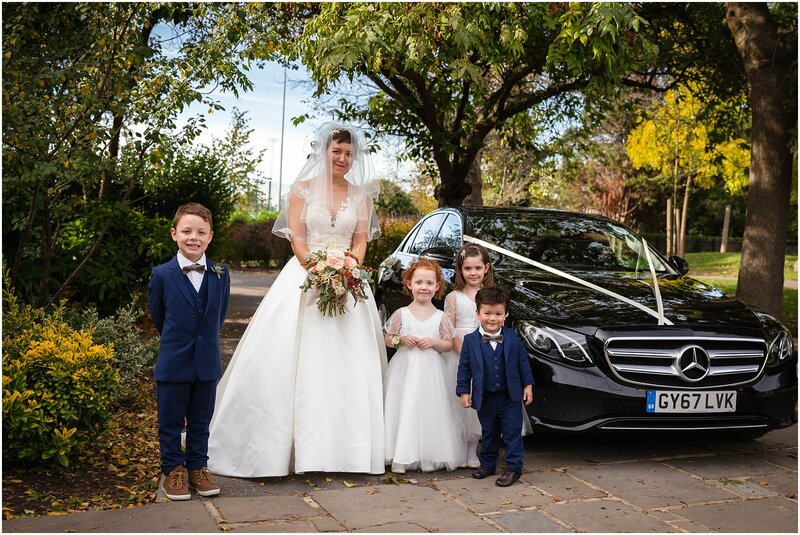 Here are a few things to consider when choosing your wedding wheels. 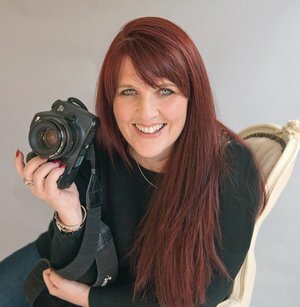 As your professional photographer, I will create timeless pieces of work that you and your family can treasure for years to come. The kind of photographs that you can hang on any wall in your house, and that will give you a warm feeling of pride and happiness whenever you look at them– after all that’s what a photography is all about!